While a variant of Samsung's Galaxy Nexus is already available internationally, the U.S. is still waiting on the subsidized CDMA version set to be sold by Verizon. This scoop shows the handset may already be in stores and is set to sell on Friday 9, 2011. Earlier, Verizon announced that the company would be offering the Galaxy Nexus before the end of 2011. Just two weeks ago, we reported rumors the phone would sell for $199 with a two-year contract and that number seems to have been confirmed. The new Nexus is especially exciting for individuals in the United States, as it is the first Ice Cream Sandwich phone to officially hit the U.S. market. Ice Cream Sandwich is said to be the most substantial update to Android thus far, including many new changes and improvements, especially in terms of usability and interface. The handset itself features an AMOLED display measuring in at 4.65-inch with a high-density resolution of 1270 x 720. The Galaxy Nexus will also include a 1.2GHz dual core OMAP 4460 processor, 1GB of RAM, a choice of 16GB or 32GB of internal storage, rear-facing 5MP camera with a back-lit CMOS sensor and a front-facing 1.3 megapixel camera for video calls. The leaked memo also mentions a few other interesting details. 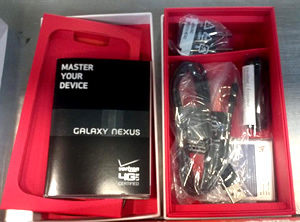 Each Verizon store will receive a minimum shipment of 15 phones. Units will be replenished as they run out. The document makes a point that stores will not be receiving the phones through their "normal" receiving process, presumably to avoid leaks similar to ones Verizon has had in the past. Stores are not to open, display or sell these phones until Friday, so those anxiously awaiting the Galaxy Nexus will have to continue to wait until the official release date. However, despite the cautionary words, the photo above is a clear demonstration of how difficult it is to keep new gadgets under wraps.